Croydon Palace, in Croydon, now part of south London, was the summer residence of the Archbishop of Canterbury for over 500 years. 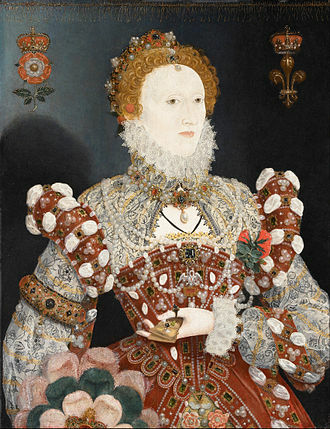 Regular visitors included Henry III and Queen Elizabeth I. Now known as "Old Palace", the buildings are still in use as the Old Palace School, an independent girls' school of the Whitgift Foundation. 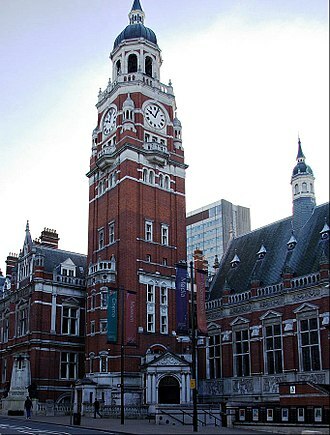 The Manor of Croydon was connected with the Archbishop of Canterbury from at least the late Saxon period, and records of buildings date back to before 960. 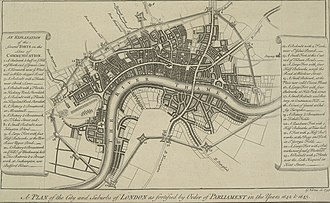 The Palace as it now exists is a group of largely 15th and 16th century buildings, "an aggregate of buildings of different castes and ages", as Archbishop Herring found it in 1754. The 15th-century Great Hall is thought to have been installed by Archbishop Stafford (d. 1452), with a late-14th-century two-storey porch and a vaulted ceiling to the lower chamber. The hall interior has a rich 16th-century timber roof and windows with interesting features such as the late Gothic interior porch. The Great Hall was partially remodelled in the 17th century by archbishops Laud and Juxon, who also rebuilt the chapel. West of the Hall are the state apartments including the first-floor Guard Room, now the school library. 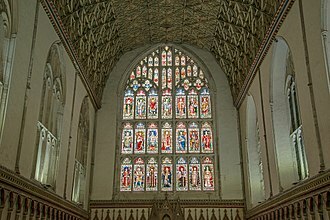 The room is ascribed to Archbishop Arundel (Archbishop 1396–1414), and has an arch-braced roof with carved stone supports and an oriel window. Other rooms have later panelling and fireplaces. The chapel has fine 17th-century stalls and an elaborate corner gallery. The fine altar rails are now in the Guard Room. The exterior of the whole palace is of stone or red brick, with early stone windows or Georgian sash windows. The connection of the Archbishops with Croydon was of great importance, with several being important local benefactors. Six are buried in Croydon Minster, neighbouring the Palace: in date order they were Edmund Grindal, John Whitgift, Gilbert Sheldon, William Wake, John Potter and Thomas Herring. Archbishop Whitgift, who first called it a "palace", liked Croydon for "the sweetness of the place", though not all admired it, in the low-lying site which Henry VIII found "rheumatick", a place where he could not stay "without sickness". Sir Francis Bacon found it "an obscure and darke place" surrounded by its dense woodland. By the late 18th century, the Palace had become dilapidated and uncomfortable and the local area was squalid. An Act of Parliament enabled Croydon Palace to be sold and Addington Palace on the outskirts of Croydon to be bought in 1807. This became the new episcopal summer residence for much of the rest of the 19th century. The historic connection between Croydon and the archbishops is recognised in the modern coat of arms of the London Borough of Croydon. Several streets in Croydon are named after the archbishops, including Whitgift Street, Grindall Close, Sheldon Street, Laud Street, Cranmer Road and Parker Road. ^ Quoted in Charles Nicholl A Cup of News: the life of Thomas Nashe, 1984, p. 136. ^ Quotes in Nicholl 1984, p. 136; in the Great Hall at Croydon Nashe's masque Summer's Last Will and Testament was performed, in October 1592. Anderson, John Corbet (1879). The Archiepiscopal Palace at Croydon. London. Drewett, Peter (1972). "The Archiepiscopal Palace at Croydon: a further contribution in the light of recent excavations". Archaeological Journal. 128: 162–165. Ducarel, Andrew (1783). Some Account of the Town, Church, and Archiepiscopal Palace of Croydon. Bibliotheca Topographica Britannica. 12. London: J. Nichols. Faulkner, P. A. (1970). 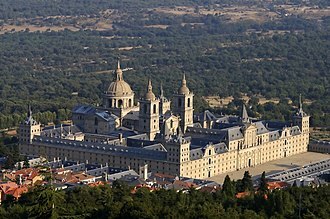 "Some medieval archiepiscopal palaces". Archaeological Journal. 127: 130–146. Oswald, Arthur (1965). "The Old Palace, Croydon, Surrey: a former residence of the Archbishops of Canterbury". Country Life. 137: 806–810, 876–80. Thornhill, Lilian (1987). From Palace to Washhouse: a study of the Old Palace, Croydon, from 1780–1887. Croydon Natural History and Scientific Society Proceedings. 17. Croydon: Croydon Natural History and Scientific Society. ISBN 0906047188. Walker, Yvonne M. (1990). The Story of Croydon Old Palace and the Archbishops of Canterbury 871–1780. Purley: AMCD Ltd & Croydon Libraries. Wikimedia Commons has media related to Old Palace School. John Whitgift was the Archbishop of Canterbury from 1583 to his death. 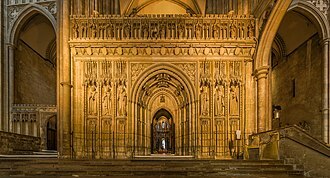 Noted for his hospitality, he was somewhat ostentatious in his habits, sometimes visiting Canterbury, Whitgifts theological views were often controversial. 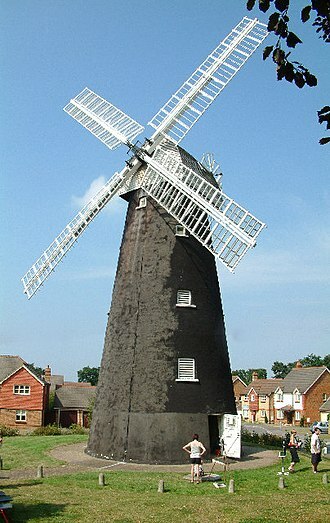 He was the eldest son of Henry Whitgift, a merchant, of Great Grimsby, the Whitgift family is thought to have originated in the relatively close Yorkshire village of Whitgift, adjoining the River Ouse. John Whitgifts early education was entrusted to his uncle, Robert Whitgift, abbot of the neighbouring Wellow Abbey, on advice he was sent to St Anthonys School. In 1549 he matriculated at Queens College, and in May 1550 he moved to Pembroke Hall, in May 1555 he became a fellow of Peterhouse. Whitgift taught Francis Bacon and his older brother Anthony Bacon at Cambridge University in the 1570s, as their tutor, Whitgift bought the brothers their early classical text books, including works by Plato and others. Having taken holy orders in 1560, he became chaplain to Richard Cox, Bishop of Ely, the following year he was appointed Regius Professor of Divinity, and became master first of Pembroke Hall and of Trinity. He had a share in compiling the statutes of the university, which passed the great seal on 25 September 1570. While at Cambridge he formed a relationship with Andrew Perne. Perne went on to live with Whitgift in his old age, puritan satirists would mock Whitgift as Pernes boy who was willing to carry his cloak-bag – thus suggesting that the two had enjoyed a homosexual relationship. An aunt with whom he once lodged wrote that though she thought at first she had received a saint into her house, macaulays description of Whitgift as a narrow, tyrannical priest, who gained power by servility and adulation. In June of the same year Whitgift was nominated Dean of Lincoln, in the following year he published An Answere to a Certain Libel entitled an Admonition to the Parliament, which led to further controversy between the two churchmen. On 24 March 1577, Whitgift was appointed Bishop of Worcester, Whitgift placed his stamp on the church of the Reformation, and shared Elizabeths hatred of Puritans. The coat of arms of the London Borough of Croydon is the official heraldic arms of the London Borough of Croydon, granted on 10 December 1965. The black cross is a cross flory, which means each arms is terminating in the shape of a fleur-de-lis, the cross is surmounted by five gold discs, so called bezants. The crossed swords refer to St. Paul and the keys to St. Peter refer to the Abbey of St. Peter and St. Paul of Chertsey. The keys were present in the crest of the arms of Coulsdon, the mural crown is a common heraldic symbol for local municipal authority in a town or city. 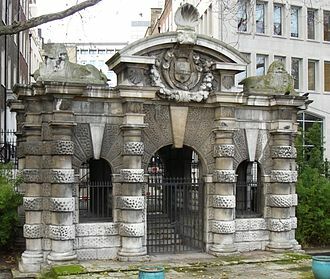 Out of the crown comes a heraldic fountain, a symbol for water, the supporters are a black lion and a silver horse. The lion comes from the arms of Coulsdon and Purley and is again a reference to Hyde Abbey, the horse is from the arms of the Earls of Surrey, since the two merged entities were situated in Surrey before becoming part of Greater London. The supporters wear collars, each with a cross formy fitchy, the motto Ad summa nitamur is Latin for Let us strive for perfection. The Archbishops Palace is an historic 14th-century and 16th-century building on the east bank of the River Medway in Maidstone, Kent. Originally a home from home for travelling archbishops from Canterbury, the building is principally used as a venue for wedding services. The former tithe barn for the palace, now serves as the Tyrwhitt-Drake Museum of Carriages, the Manor of Maidstone was probably given to the Archbishops of Canterbury as a royal gift during the 7th or 8th centuries. Cornhills house was demolished by Archbishop Ufford, the first work on the current building was ordered by Archbishop Ufford in 1348 and was continued by Archbishop Islip between 1349 and 1366, partly with materials from a palace at Wrotham. At the end of the 14th century Archbishop Courtenay expanded the establishment in Maidstone when he founded the neighbouring College, the palace was enlarged and improved by Archbishop Morton in 1486, but it and the College were given to Henry VIII by Archbishop Cranmer in exchange for property elsewhere. Henry VIII granted the palace to Sir Thomas Wyatt, but the estate was forfeited to the Crown in 1554 following the led by his son, Thomas Wyatt the younger. 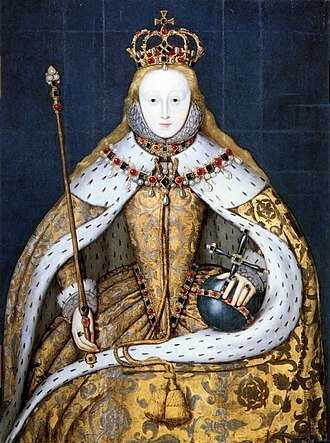 It was given by Elizabeth I to Sir John Astley, son of John Astley, Astley extended the palace, building much of the existing structure. On his death there in 1639, he bequeathed the manor to Jacob Astley, lord Astley died at the palace in 1652 and it passed to his son and grandson, the second and third barons. 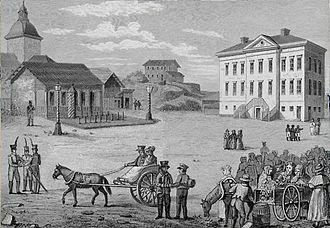 On the death of the baron in 1688, the barony became extinct. In 1720, Sir Jacob sold the palace to Robert Marsham, the palace was subsequently sold by the Marsham family. At the beginning of the 20th century it was used as a Territorial Army medical school, today the palace is managed by Kent County Council and primarily used as a register office. It is only open to the public on regular Heritage Days, the Kent Gardens Trust tends the Apothecarys Garden which is open to the public between May and August on Wednesday afternoons only. A sash is a large and usually colorful ribbon or band of material worn around the body, draping from one shoulder to the opposing hip, or else running around the waist. The sash around the waist may be worn in daily attire, ceremonial sashes are found in a V-shaped format, draping from both shoulders to the stomach like a large necklace. In Latin America and some countries of Africa, a presidential sash indicates a presidents authority. Sashes traditionally form part of military attire. Most of the European Royal families wear sashes as a part of their royal regalia, some orders such as the Légion dhonneur include sashes as part of the seniormost grades insignia. Likewise Italian military officers wear light blue sashes over the shoulder on ceremonial occasions. Sashes are a feature of some regiments of the modern French Army for parade dress. In its traditional Franco-Algerian or zouave form the sash was four metres in length, in the historic French Army of Africa, sashes were worn around the waist in either blue for European or red for indigenous troops. At the time of the American Civil War silk sashes in crimson were authorized for officers, generals continued to wear buff silk sashes in full dress until 1917. In the Confederate Army of the Civil War period sash colour indicated the corps or status of the wearer. For example, gold for cavalry, burgundy for infantry, black for chaplains, red for sergeants, green or blue for medics, and grey or cream for general officers. With the exception of the West Point Band Drum Major, today the West Point cadet officer is the person in the US Army who wears a sword and sash. The modern British Army retains a scarlet sash for wear in certain orders of dress by sergeants and above serving in infantry regiments, over the right shoulder to the left hip. A similar crimson silk net sash is worn around the waist by officers of the Foot Guards in scarlet full dress, the same practice is followed in some Commonwealth armies. The present day armies of India and Pakistan both make use of waist-sashes for ceremonial wear. Croydon Minster is the parish and civic church of the London Borough of Croydon. There are currently more than 35 churches in the borough, with Croydon Minster being the most prominent, six Archbishops of Canterbury are buried in the church, Edmund Grindal, John Whitgift, Gilbert Sheldon, William Wake, John Potter, and Thomas Herring. 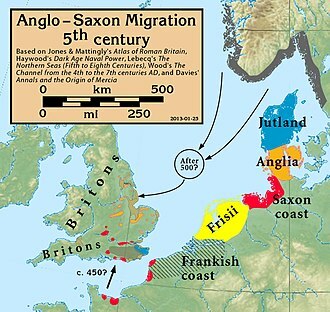 A charter issued by King Coenwulf of Mercia refers to a council which had taken place close to what is called the monasterium of Croydon, an Anglo-Saxon will made in about 960 is witnessed by Elfsies, priest of Croydon, and the church is mentioned in Domesday Book. In its final form, the church was mainly a Perpendicular-style structure of late 14th. It still bears the arms of archbishops Courtenay and Chicheley, believed to have been its benefactors, the medieval building underwent some restoration in 1851 and 1857–9, under the direction of George Gilbert Scott. The churchs reconsecration by Archbishop Archibald Tait took place on 5 January 1870, the church still contains several important monuments and fittings saved from the old building. The church was elevated to the status of Croydon Minster on 29 May 2011, Croydon has strong religious links, Croydon Palace having been a residence of the Archbishop of Canterbury from at least the beginning of the 13th century to the beginning of the 19th. The Bishop of Croydon is a position as a bishop in the Anglican Diocese of Southwark. The current area bishop is Jonathan Clark, who was consecrated on 21 March 2012, until recently the vicar was Colin J. Luke Boswell, Vicar of Croydon and Chaplain to the Whitgift Foundation. The church has a large pipe organ, much of which is by William Hill & Sons. A specification of the organ is on the National Pipe Organ Register, there is a small organ in the St Nicholas Chapel which was obtained from St Mary the Virgin, Preston Candover in 1997. A specification of the organ is on the National Pipe Organ Register. Before the fire of 1867 records are incomplete, but include, after the fire of 1867, John Rhodes 1857–1868 Frederick Cambridge 1868–1911 F.
Oriel windows in Kłodzko, Poland. Oriel windows in San Francisco, California, USA. Oriel windows with brackets in Oloron-Sainte-Marie, France. John Whitgift at Queen Elizabeth's deathbed. The archbishop's death is given as 1603 because of Old Style and New Style dates. Effigy of Emma, mother of Archbishop John Stafford(d.1452), North Bradley Church, Wiltshire. Inscription in ledger-line: hic jacet d(omin)a Emma mater Venerabilissimi patris et domini D(omi)ni Joh(ann)is Stafford dei gra(tia) Cantuariensis Archiepi(scopi) qu(a)e obiit quinto die mensis Septembris anno d(omi)ni Mille(n)simo ccc.mo quadra(gen)s(i)mo vi.o cui(us) anime p(ro)piciet(ur) de(us) am(en) ("Here lies Lady Emma mother of the most venerable father and lord, Lord John Stafford by the grace of God Archbishop of Canterbury, who died on the 5th day of the month of September in the one thousandth four hundredth and sixth year of our Lord, on whose soul may God look with favour amen"